One mans’ waste is anothers bounty. 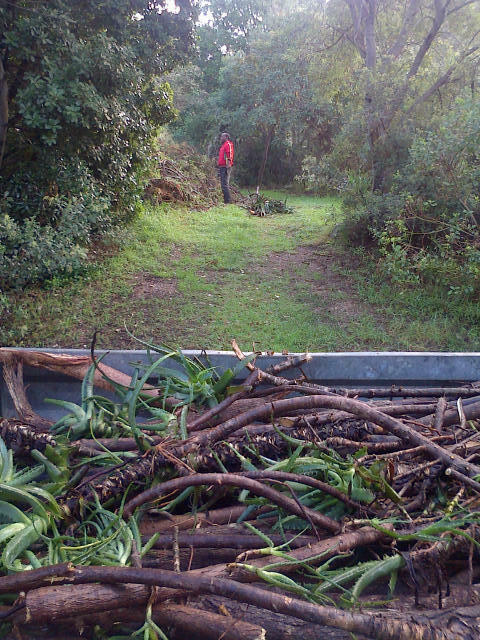 Collecting Aloe Arborescens truncheons from the nature reserve where they were pruned and discarded. They will form an aloe hedge integral to my earthworm farm and landscaping at home. 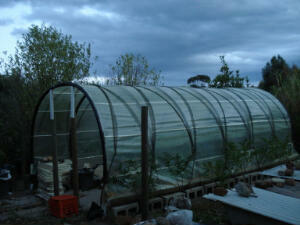 Winter is fast approaching and my poly tunnel has now stood for a year incomplete. The winds have lashed and buckets of rain have not been able to dislodge it. However these testing conditions have resulted in further tensioning. I am confident it can stand and survive many seasons to come. Productivity and experimentation are the upcoming goals. I am going to make use of this warm winter environment to keep the worms productive, do germination and propagate cuttings. Perhaps this low cost design will appeal to gardeners. 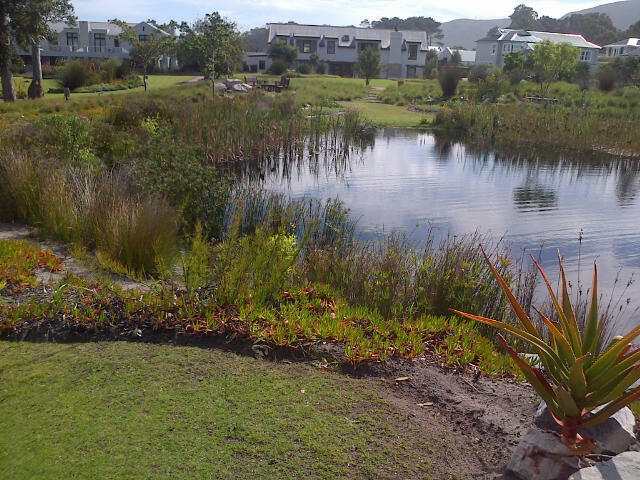 Beautiful architecture complimented by a custom garden within the park central to the village. 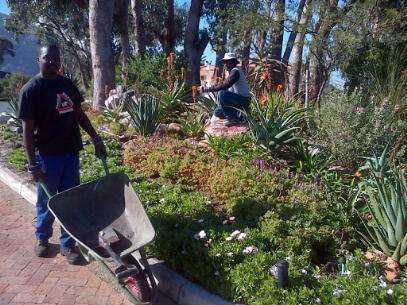 A variety of aloes planted with ground covers and shrubs. 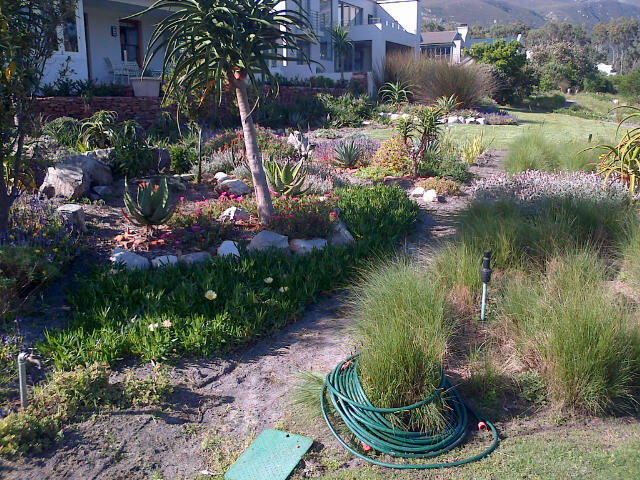 A beautiful touch of summer today in our garden at Lakewood village Hermanus. It is a pleasure to be able to plant in the right place at the right time and be assured of success. 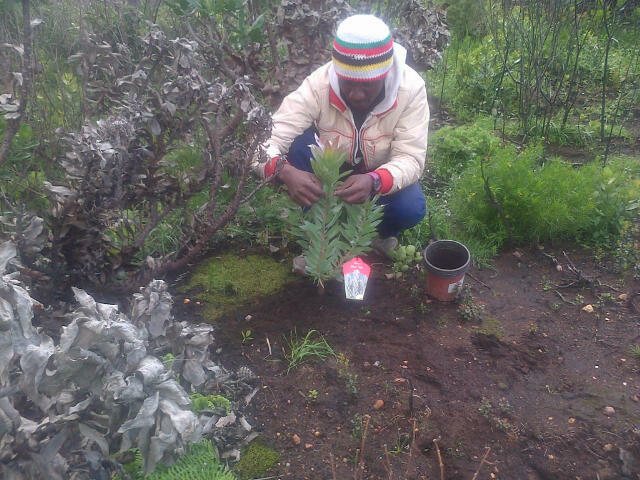 The recent fire burnt a large area of a Fynbos garden which included a copse of Silver Trees ( leucadendron argenteum) This is a striking tree, the largest leucadendron( up to 10m), which has grey/silver reflective leaves and definitive cone flowers. 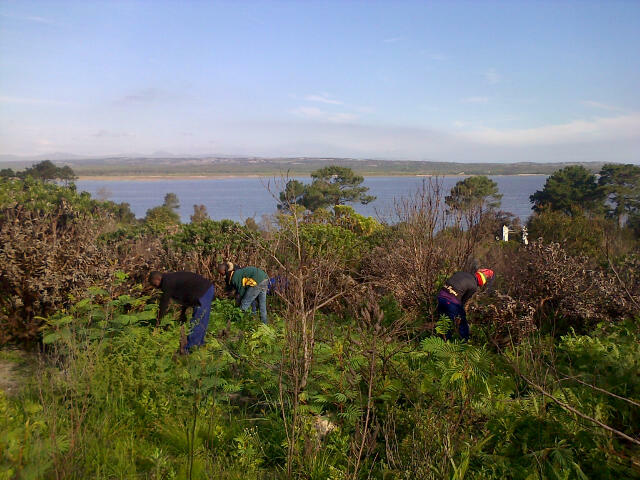 We are replacing some destroyed and scorched trees with some young plants. 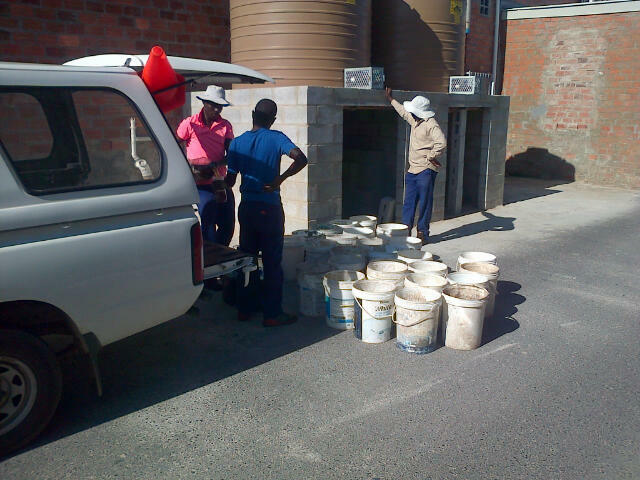 Our planting is simplified by the perfect acidic well drained soil which does not require additives. The roots are sensitive, so our gentle hands skills have made transferring the plant from pot to soil less stressful. We are looking forward to the recovery and new growth in the garden. The best time of the year to pull these invasive wattles is during the winter when the soil is moist. We choose to hand pull rather than use poison which is harmful to the enviroment. Poisoning is not thorough. Some criticize pulling saying it stimulates germination,if so, so be it, the sooner the seed bank is reduced the better. We carried out this task at the end of a hard days work preparing holes for replacement trees lost in the conflagration. It was a good way to wind the day down, chatting, joking and stretching. 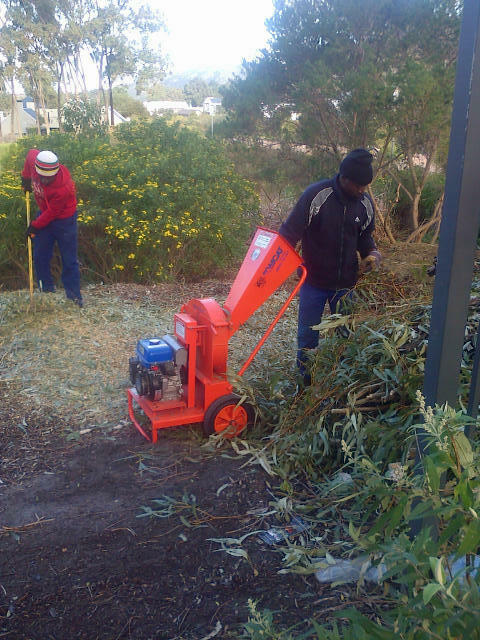 Magicians have wands, doctors scalpels and gardeners have mulching machines. Our spells improve soil by adding mulch, liberally, which imitates the effect of a forest floor. Rich humus forms under the mulch layer, improving the fertility, water retention and soil fauna biome. An environment which quickly attracts the masters of soil management: earthworms. This is an organic method I favour as it also provides a way to return all the clippings, cuttings ,weeds and debris back to the garden. Carbon return offsets the small carbon footprint we have and leads to a concious earth loving method of gardening.